1Saint Vincent’s University Hospital, Dublin. The left atrial appendage (LAA) has a key role in the embolic complications of atrial fibrillation (AF). It has been studied extensively, from recent interest in the thrombotic implications of various LAA morphologies to LAA occlusion and ablation. We collected eleven post-mortem LAA samples for visual analysis, two were not included due to poor sample quality. On examination of the nine remaining samples, several common patterns of pectinate muscle orientation were noted. The LAA samples were noted to have a smooth circumferential neck of muscular tissue giving rise to a dominant singular smooth trunk of papillary muscle in 6 cases and two trunks in 3 cases. These trunks were either shallow (5 samples) or more muscular and raised (4 samples). Shallow trunks tended to be wider than the raised trunks and may even be circumferential (2 samples). The main trunk arborized to give off papillary muscle branches down to third or fourth order branches. The samples were visually assessed for the percentage of smooth papillary muscle versus non-papillary recesses and were found to have ≤50% smooth muscle in 3 samples, 50-75% in 3 samples and >75% in 3 samples. We performed histological analysis of further LAA samples collected during cardiac surgery in a parallel study. We identified a distinct pattern of myocyte orientation from the neck, mid-section and apical section of the LAA demonstrating arborization of myocyte fibers with minimal communication in distal segments of the LAA. 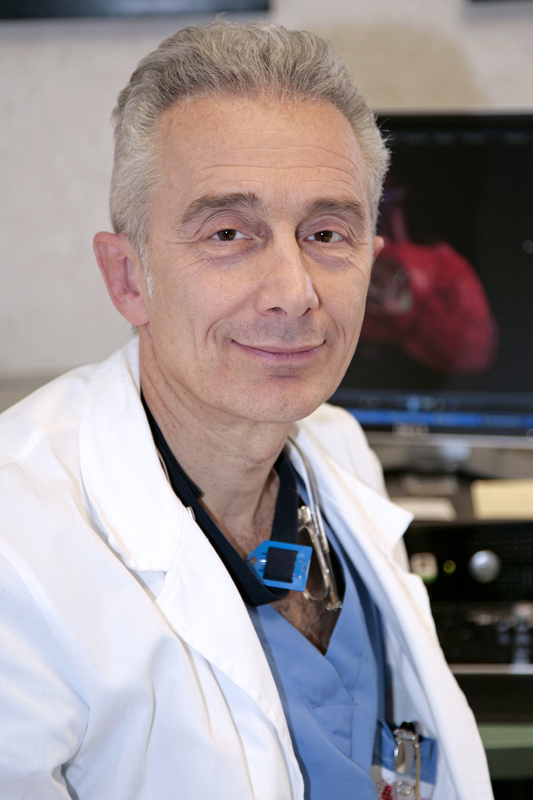 We feel that this information may help understanding of the issues surrounding LAA ablation strategies. Key Words : Left Atrial Appendage (LAA), Chicken Wing, Windsock, Cauliflower. The left atrial appendage (LAA) has a key role in the formation of thrombus and subsequent embolic complications in atrial fibrillation (AF) and flutter and has been shown to be involved in >90% of transient ischemic attacks (TIA) or strokes related to AF. (1) For a small anatomical structure, it has been studied extensively from the recent interest in the various morphologies of the LAA and their relative risk of thrombosis to LAA closure devices and the success of ablation procedures incorporating LAA isolation. In this paper we aim to review atrial anatomy relevant to the electrophysiologist, review the role of the LAA in AF initiation and propagation and we also provide a description of the macro and microscopic properties of the LAA based on post-mortem studies. The fully formed left atrium is composed of the postero-superior venous component, the vestibule forming the mitral valve orifice, the LAA and the body of the atrium. The LAA is separated from the left pulmonary veins venous component by the left lateral ridge. This is an infolding of the lateral atrial wall protruding into the LA endocardium. (4) The LAA lies anteriorly in the atrioventricular sulcus in close proximity to the left circumflex artery and the left phrenic nerve. The LAA itself is divided into the os, the neck and the body; all of which can be variable in morphology. The body of the LAA is divided into a number of lobes which is again variable. The internal surface of the LAA is composed of raised pectinate muscles which results in an uneven surface – in direct contrast to the relatively smooth walls of the rest of the left atrium. 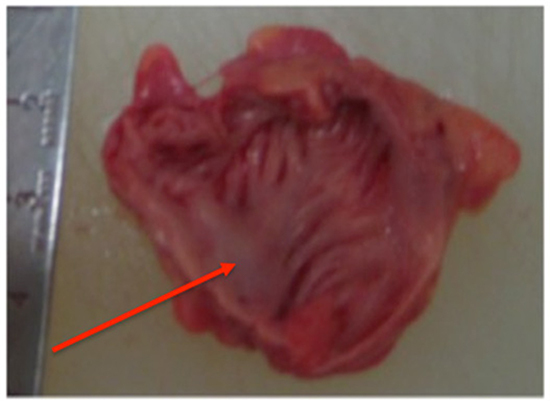 This irregular surface with deep recesses likely increases its thrombogenicity. We collected LAA samples from consecutive post-mortems being carried out in a tertiary referral centre with cooperation from the pathology department. Ethical approval was granted in advance of the study by the local ethics committee and written consent was obtained from next-of-kin. All available postmortem subjects were included. 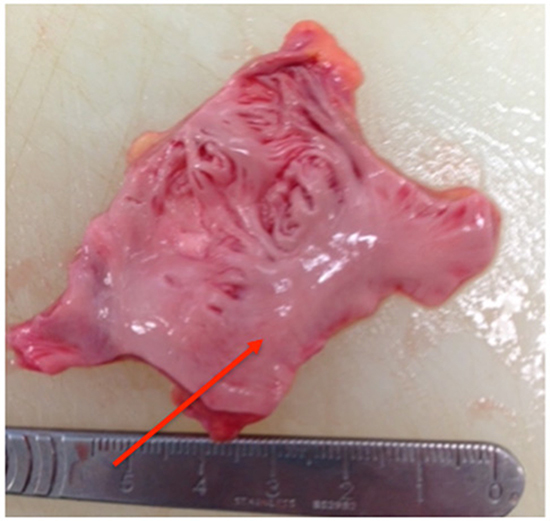 LAA’s were removed from the heart in a circumferential fashion by the pathologist performing the post-mortem. Once LAA samples were collected, they were subsequently opened up through a longitudinal dissection to reveal the inner surface with particular attention paid to the pectinate muscle orientation. The samples were then examined, photographed and disposed of. Some histological samples were taken for other projects with ethical approval and consent. The main trunk arborized to give off papillary muscle branches down to third order or in some cases to fourth order branches. The samples were visually assessed for the percentage of smooth papillary muscle versus non-papillary recesses and were found to have ≤50% smooth muscle in 3 samples, 50-75% in 3 samples and >75% in 3 samples. We performed histological analysis of further LAA samples from a parallel study gathered during surgical LAA excision. Using these samples we identified a pattern of myocyte orientation of the neck, mid-section and apical section of the LAA. In the images, the epithelial surface can be identified by the presence of adipose tissue. 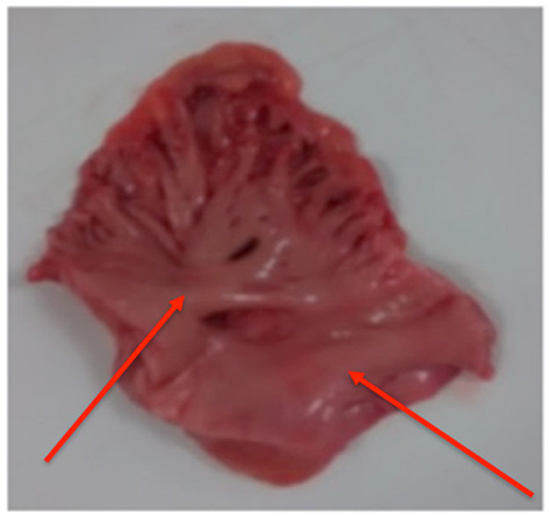 We found that the neck or proximal portion of the LAA had dense circumferential orientation of the myocytes. In the mid-section of the LAA, arborization of the papillary muscles can be appreciated with fibrous separation between myocyte bundles. Finally, in the apical segment of the LAA, myocytes can be seen reaching the epithelial surface in discrete bundles with very little communication between each bundle, often limited to one or two individual myocytes. We have identified via the examination of a small number of left atrial appendages a common pattern of macroscopic papillary muscle orientation; namely a circumferential smooth ostium with the emergence of one or two papillary muscle trunks. Histological analysis of separate LAA samples have shown arborization of myocyte fibers with minimal communication in distal segments of the LAA. Perhaps the presence of prominent or multiple muscle trunks could result in difficulty in full isolation of the appendage during LAA ablation. These muscular bundles may also serve as a source of triggered arrhythmias. We believe, although our study is limited by small sample size, further study in this area is warranted and that this information could be used to investigate ablation strategies. It is known that longer p wave durations are associated with increased risk of AF and a reduction post PVI are associated with improved outcomes. (16, 17) Kawamura et al. examined the resultant effects of left atrial ligation on atrial conduction. They found that LAA exclusion in 15 patients with paroxysmal and persistent AF by the LARIAT device, which results in LAA necrosis, results in a significant reduction in p wave duration and amplitude. (18) There were greater reductions in p wave duration and amplitude in those who remained free from AF than those who had recurrence. These p wave changes are consistent with decreased atrial mass and decreased atrial dispersion that may represent reverse electrical atrial remodeling. This may explain in part the positive results seen in LAA isolation. Further investigation as to the macroscopic variations within the LAA and their potential thrombogenicity may reveal pectinate muscular characteristics associated with increased thrombotic risk post ablation. The left atrial appendage plays a key role in the stroke risk associated with AF, however, its role in the initiation and propagation of AF may be underestimated. We believe that left atrial appendage muscular bundle characteristics are worthy of further investigation as to their potential role in atrial fibrillation with potential implications for ablation strategies. Aryana Arash, SaadEduardo B, d'AvilaAndré. Left atrial appendage occlusion and ligation devices: what is available, how to implement them, and how to manage and avoid complications. Curr Treat Options Cardiovasc Med. 2012;14 (5):503–19. Moorman Antoon, WebbSandra, BrownNigel A, LamersWouter, AndersonRobert H. Development of the heart: (1) formation of the cardiac chambers and arterial trunks. Heart. 2003;89 (7):806–14. DeSimone Christopher V, GabaPrakriti, TriJason, SyedFaisal, NoheriaAmit, AsirvathamSamuel J. A Review of the Relevant Embryology, Pathohistology, and Anatomy of the Left Atrial Appendage for the Invasive Cardiac Electrophysiologist. J Atr Fibrillation. 2016;8 (2):81–87. Cabrera José Angel, SaremiFarhood, Sánchez-QuintanaDamián. Left atrial appendage: anatomy and imaging landmarks pertinent to percutaneous transcatheter occlusion. Heart. 2014;100 (20):1636–50. Veinot J P, HarrityP J, GentileF, KhandheriaB K, BaileyK R, EickholtJ T, SewardJ B, TajikA J, EdwardsW D. Anatomy of the normal left atrial appendage: a quantitative study of age-related changes in 500 autopsy hearts: implications for echocardiographic examination. Circulation. 1997;96 (9):3112–5. Di Biase Luigi, SantangeliPasquale, AnselminoMatteo, MohantyPrasant, SalvettiIlaria, GiliSebastiano, HortonRodney, SanchezJavier E, BaiRong, MohantySanghamitra, PumpAgnes, Cereceda BrantesMauricio, GallinghouseG Joseph, BurkhardtJ David, CesaraniFederico, ScaglioneMarco, NataleAndrea, GaitaFiorenzo. Does the left atrial appendage morphology correlate with the risk of stroke in patients with atrial fibrillation? Results from a multicenter study. J. Am. Coll. Cardiol. 2012;60 (6):531–8. Douglas Yvonne L, JongbloedMonique R M, Gittenberger-de GrootAdriana C, EversDorothea, DionRobert A E, VoigtPieter, BartelingsMargot M, SchalijMartin J, EbelsTjark, DeRuiterMarco C. Histology of vascular myocardial wall of left atrial body after pulmonary venous incorporation. Am. J. Cardiol. 2006;97 (5):662–70. Kirchhof Paulus, BenussiStefano, KotechaDipak, AhlssonAnders, AtarDan, CasadeiBarbara, CastellaManuel, DienerHans-Christoph, HeidbuchelHein, HendriksJeroen, HindricksGerhard, ManolisAntonis S, OldgrenJonas, PopescuBogdan Alexandru, SchottenUlrich, Van PutteBart, VardasPanagiotis. 2016 ESC Guidelines for the management of atrial fibrillation developed in collaboration with EACTS. Eur. Heart J. 2016;37 (38):2893–2962. Elayi Claude S, VermaAtul, Di BiaseLuigi, ChingChi Keong, PatelDimpi, BarrettConor, MartinDavid, RongBai, FahmyTamer S, KhaykinYaariv, HongoRichard, HaoSteven, PelargonioGemma, Dello RussoAntonio, CasellaMichela, SantarelliPietro, PotenzaDomenico, FanelliRaffaele, MassaroRaimondo, ArrudaMauricio, SchweikertRobert A, NataleAndrea. Ablation for longstanding permanent atrial fibrillation: results from a randomized study comparing three different strategies. Heart Rhythm. 2008;5 (12):1658–64. Tilz Roland Richard, RilligAndreas, ThumAnna-Maria, AryaAnita, WohlmuthPeter, MetznerAndreas, MathewShibu, YoshigaYasuhiro, WissnerErik, KuckKarl-Heinz, OuyangFeifan. Catheter ablation of long-standing persistent atrial fibrillation: 5-year outcomes of the Hamburg Sequential Ablation Strategy. J. Am. Coll. Cardiol. 2012;60 (19):1921–9. Cheema Aamir, DongJun, DalalDarshan, MarineJoseph E, HenriksonCharles A, SpraggDavid, ChengAlan, NazarianSaman, BilchickKenneth C, AlmasryIbrahim, SinhaSunil, ScherrDaniel, HalperinHenry, BergerRonald, CalkinsHugh. Circumferential ablation with pulmonary vein isolation in permanent atrial fibrillation. Am. J. Cardiol. 2007;99 (10):1425–8. Di Biase Luigi, BurkhardtJ David, MohantyPrasant, SanchezJavier, MohantySanghamitra, HortonRodney, GallinghouseG Joseph, BaileyShane M, ZagrodzkyJason D, SantangeliPasquale, HaoSteven, HongoRichard, BeheirySalwa, ThemistoclakisSakis, BonsoAldo, RossilloAntonio, CorradoAndrea, RavieleAntonio, Al-AhmadAmin, WangPaul, CummingsJennifer E, SchweikertRobert A, PelargonioGemma, Dello RussoAntonio, CasellaMichela, SantarelliPietro, LewisWilliam R, NataleAndrea. Left atrial appendage: an underrecognized trigger site of atrial fibrillation. Circulation. 2010;122 (2):109–18. Di Biase Luigi, BurkhardtJ David, MohantyPrasant, MohantySanghamitra, SanchezJavier E, TrivediChintan, GüneşMahmut, GökoğlanYalçın, GianniCarola, HortonRodney P, ThemistoclakisSakis, GallinghouseG Joseph, BaileyShane, ZagrodzkyJason D, HongoRichard H, BeheirySalwa, SantangeliPasquale, CasellaMichela, Dello RussoAntonio, Al-AhmadAmin, HranitzkyPatrick, LakkireddyDhanunjaya, TondoClaudio, NataleAndrea. Left Atrial Appendage Isolation in Patients With Longstanding Persistent AF Undergoing Catheter Ablation: BELIEF Trial. J. Am. Coll. Cardiol. 2016;68 (18):1929–1940. Rillig Andreas, TilzRoland R, LinTina, FinkThomas, HeegerChristian-H, AryaAnita, MetznerAndreas, MathewShibu, WissnerErik, MakimotoHisaki, WohlmuthPeter, KuckKarl-Heinz, OuyangFeifan. Unexpectedly High Incidence of Stroke and Left Atrial Appendage Thrombus Formation After Electrical Isolation of the Left Atrial Appendage for the Treatment of Atrial Tachyarrhythmias. Circ Arrhythm Electrophysiol. 2016;9 (5):–. Gonna Hanney, GallagherMark Michael, GuoXiao Hua, YapYee Guan, HnatkovaKaterina, CammA John. P-wave abnormality predicts recurrence of atrial fibrillation after electrical cardioversion: a prospective study. Ann Noninvasive Electrocardiol. 2014;19 (1):57–62. Van Beeumen Katarina, HoubenRichard, TavernierRene, KetelsStefan, DuytschaeverMattias. Changes in P-wave area and P-wave duration after circumferential pulmonary vein isolation. Europace. 2010;12 (6):798–804. Kawamura Mitsuharu, ScheinmanMelvin M, LeeRandall J, BadhwarNitish. Left atrial appendage ligation in patients with atrial fibrillation leads to a decrease in atrial dispersion. J Am Heart Assoc. 2015;4 (5):–.